The A320 is the aircraft that really made Airbus a major force in civil airliners and has sold over 4,700 units not including its derivatives (A318, 319, 321) which have sold over 3,000 more. The A320's development goes back as far as the 1970s and when it first flew it was renowned as the first airliner in the world with digital fly by wire systems. The programme was officially launched in March 1984 and by the time it first took off on February 22, 1987 it had a decent orderbook, massively bolstered by Northwest's order for 100. The type has certainly met all of Airbus' hopes and successfully saw off both the 737-300/400 and MD-80/90, whilst still being able to compete against the 737NG series without major changes. Finally due for an update, from 2012 Airbus announced that a series of upgrades would be added to the A320 including large winglets (called Sharklets). With the further development of the airframe into the A320neo the original series has been retrospectively renamed the A320ceo (current engine option). It is certain that A320ceos will be flying alongside their neo brothers for decades yet. 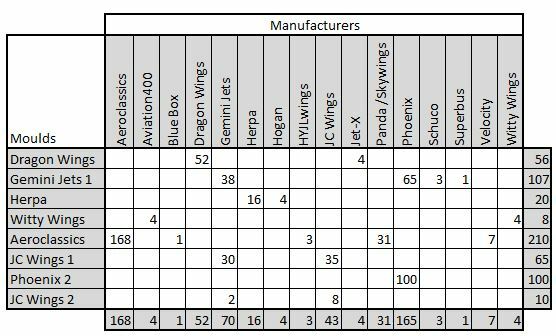 Given that the A320 nowadays makes up 50% of the mainline narrowbody jet fleet it is unsurprising that it has been a popular aircraft in 1:400 scale with nearly 600 models produced. The A320-100 is outwardly the same as an A320-200 (except for the winglets) so I don't feel the need to separate them. This review does not cover the A320NEO series. Later models seem to be much improved, which isn't hard, and by 2001 they had much better undercarriage (albeit one that seems too small for the fuselage) and a seemingly improved nose shape. Dragon has continued to release a few A320s in recent years (they seem to have a contract with Airbus whch goes to show that the manufacturers of the aircraft themselves don't care about accuracy) however the mould is very out of date compared to later moulds and is impossible to recommend given the simple undercarriage, poor nose, tail seam and wing joint seam. They have done a sharkletted version as recently as 2012 but frankly its still crap. The mould was used for 52 Dragon and 4 old Jet-X releases. Gemini's early A320 is a perfectly decent attempt at the type, albeit one that looks a little dated compared to the most recent offerings. The shape is pretty good though the nose isn't quite the right shape. There is also a wing, fuselage seam but its quite discrete. The undercarriage legs are quite simple but for the year of release more than passable. Gemini used this mould 40 times but in recent years has transitioned to the JC Wings moulds (though oddly an Allegient example on this mould appeared as late as 2014). Phoenix also used this mould from 2004 for 65 releases before replacing it with their own mould in 2013. A year earlier they had also transitioned to rolling gears on this mould for the last 14 releases. Three models were made as Schucos and a single model was also produced under the SuperBus Models brand. Herpa's old A320 is not very impressive. Early examples like this Silk Air have a large wing seam and slightly odd looking nose. The undercarriage legs are simple, appear to short and the tyres seem too large. By 2007 it seems the undercarriage has been much improved as you can see in this Bangkok Airways example. A third modification to the gear happened in 2011 (see this Condor) but I don't think it improved things much. Oddly there most recent two A320s have used other company's moulds - one appears to use Witty Wings pretty poor mould and the other JC Wings much superior mould. Not sure what Herpa is doing really here. Hogan have also used this mould a few times. This mould rates up with the Dragon mould as the worst of the A320s available. It is very poor and in fact could almost pass as some other aircraft type other than an A320. The nose is chunky and the whole mould has an odd tail down profile. The tail also looks too small. It is a shame as they released a Ural Airlines model but on this mould its a no go. I miss several of Witty's moulds since they packed up shop - but not this one! Aeroclassics made a few ripples in 2009 when it entered the modern arena with its first Baby Bus branded A320s. The mould is excellent being completely seamless and perfectly proportioned. It is not without some issues though. The nosegear wheels are too small sometimes giving the models a nose down aspect. The IAE engined examples also sport engines which are too long and large. Even so the AC A320s are a treat and Aeroclassics have made great use of the mould. Aeroclassics are not the only ones to have used the mould however. The mould was also used by the short-lived and controversial Velocity Models, which was started by an ex-Gemini Jets employee and really got Gemini's back up. Velocity appear to have been using the mould under license from Aeroclassics. Even more controversially in 2015 Aeroclassics had a huge falling out with one of its suppliers (Kang Kai) after they started releasing GSE marked as Aeroclassics. Kang Kai started releasing models in 2015, in the Chinese market only, under the brand name Panda Models and have built up a partnership with Skywings and also HYJLwings. Much to Aeroclassics rage they have seemingly cloned the Aeroclassics A319/320 moulds and have been releasing themselves lots of A320s. Without a doubt there is a lot of dodgy stuff going on, although whether we will ever know the full truth is doubtful. Aeroclassics are apoplectic about Panda models in general. All I can do is report on the models and let AC and Panda resolve their issues between themselves. Panda's releases are up to the same high standard as Aeroclassics releases but I agree this is a cloned mould. One thing to note with this mould is, as with all Aeroclassics, it has no aerials. Or at least it didn't until early 2016 when Panda began adding aerials to the mould. They look really good too. JC Wings started making A320s in 2010 and with Gemini switching their manufacturing to JC factories they also began to use the new mould too. The shape of the mould is good and later versions have had the antennae and comms humps added. The mould's big failings relate to the wing seam and undercarriage. The seam is very large and obvious however it at least fits the shape of the fuselage, when it is properly fitted that is. The undercarriage is a decent length but is very simple and not well defined, especially for the nosegear. I know some people had real problems with this mould, but it didn't bother me that much. Regardless JC Wings has created a newer mould in late 2016 and now both JC Wings and Gemini are using that. Phoenix released its own new A320 mould (and A321) in 2013 and has been putting out a lot of models on it since then. The mould is pretty good and comes with antennae. It is seamless though I don't think the nose shape (or cockpit printing) is as accurate as the Aeroclassics or JC Wings efforts. The undercarriage legs are nicely detailed and nosegear the correct size. The nosegear wheels often have tabs left on them so they aren't perfectly round and print quality issues are fairly common. The IAE engined examples sport engines which are too long and large. The vertical stabiliser leading edge shape as it joins the fuselage appears a bit clumsy too. It's still a good mould but not as good as the Aeroclassics and on par with the JC Wings versions. JC Wings have commendably been putting a lot of effort into new moulds towards the end of 2016 and one of the fruits of this was a new mould for their maligned A320. Unfortunately the new mould is not without its own problems some of which are worse than the mould it replaced. The new mould is seamless which is its main plus point. The tailcone after the vertical stabilizer is not long enough and the end point therefore is too tall. In terms of antennae the mould sometimes has them all and sometimes does not. The rest of the fuselage moving forward is fine until you get to the nose. It’s not too bad but the shape is inferior to the previous JC Wings mould and certainly inferior to the Aeroclassics and Panda models versions. Lastly the nosegear is in the wrong position; as with the JC Wings A330 it is slightly too far aft. Unfortunately on the much smaller A320 its inaccuracy is much more obvious. The nosegear leg itself is chunky and rather ugly. In general this mould is as good as the Phoenix but inferior to the Aeroclassics and Panda. How do the current A320 moulds compare to each other in detail? Find out soon.